Bruce Kapp is on call. Should any equipment break down at Bellerive CC or if there is a part needed that’s not already on-hand, it’ll be his phone that rings. Kapp is the longtime service manager for Erb Turf Equipment, the region’s John Deere turf products distributor, located in Belleville, Ill. As the official equipment provider for Bellerive CC, and therefore the official equipment provider for the 100th PGA Championship, he and his team have the green light to drop everything if a need arises for Carlos Arraya and his crew. Erb Turf Equipment services some 450 golf courses 250 miles in any direction. Missouri and Illinois comprise most of their region, along with a dozen counties in Kentucky. 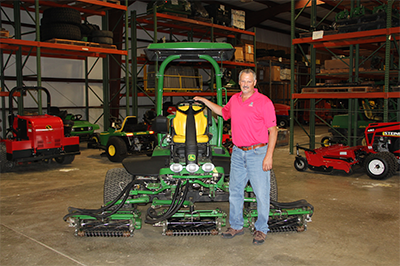 About 60 percent of their business is golf, with company owner Stan Erb founding one of the original John Deere Golf distributors back in the early 1980s. 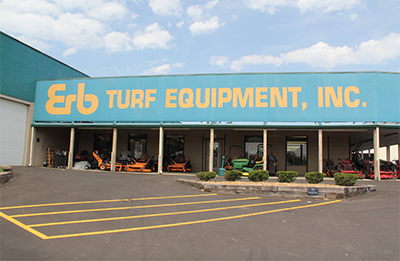 All the Pro Gators, Utility Gators, walk-behind greens mowers, triplex mowers, rough mowers, intermediate mowers and sprayers at Bellerive have the Erb Equipment seal of approval. The distributor has also assigned one of its mechanics to work at Bellerive full-time the week of the PGA Championship, rather than reporting to Erb Equipment, which is about 40 miles east of the course. 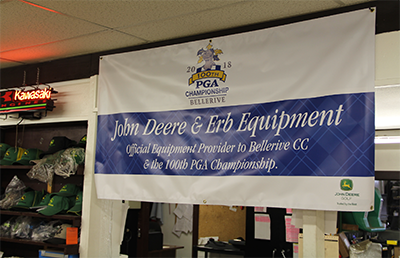 To celebrate the hard work of Erb Equipment on behalf of the PGA Championship, representatives from John Deere visited the facility this week and presented the crew of 35 people with a banner commemorating the 100th PGA Championship, along with a catered lunch. Kapp is happy to have success at Bellerive, and he’s also delighted that the golf business in the area has been on the upswing for the past several years.